NuaDHA® 500 is a food supplement with one of the highest concentrations of DHA(docosahexaenoic acid as triglyceride) (500 mg/soft gel) in the worldwide market of chewable DHA softgels. NuaDHA® 500 is a food supplement with one of the highest concentrations of DHA(docosahexaenoic acid as triglyceride) (500 mg/soft gel) in the worldwide market of chewable DHA softgels. Its pleasant lemon flavour is aimed to encourage the use of this important nutrient amongst children and elderly people with difficulties to swallow. It is also an ideal product for pregnant women, where this nutrient is so important. 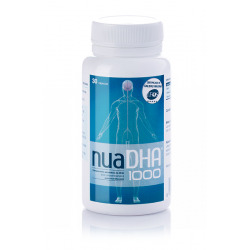 NuaDHA 500 has a high bioavailability since it is present on a triglyceride form. In the human body, DHA is part of important tissues such as retina, nervous tissue, the brain gray matter, kidneys and even reproductive organs or the skin. It is an essential nutrient during the last quarter of the pregnancy and the first year of life, being crucial in the visual and brain development of children from conception to adulthood. The human body cannot synthesise sufficient DHA and therefore, everybody is deficient in this nutrient (our diet supplies 100-150 mg/day), thus depending on the diet to acquire it. The minimum nutritional requirements are 250-300 mg DHA/day. Due to its high purification, NuaDHA® 500 is safe and adequate for pregnant and breastfeeding women (2-3 soft gels a week or even 1 a day). The softgel type used in NuaDHA® 500 is quite unique, since it can be chewed, swallow or cut at the tip and emptied in a yogurt, fruit pure etc. One softgel of NuaDHA 500 has between 2 and 5 times more DHA than other chewable products currently available and at a very competitive price.